The internet is a magical place, able to resurrect careers—and mustaches—from seemingly out of nowhere. Of course, Girogio Moroder is far from “nowhere,” but he is as baffled as you are by the recent upswelling of admiration from a millennial generation who were not even born when he was actively making music. The irony in that sentence is not lost on his most ardent fans, who always knew Moroder’s music was destined for the future. 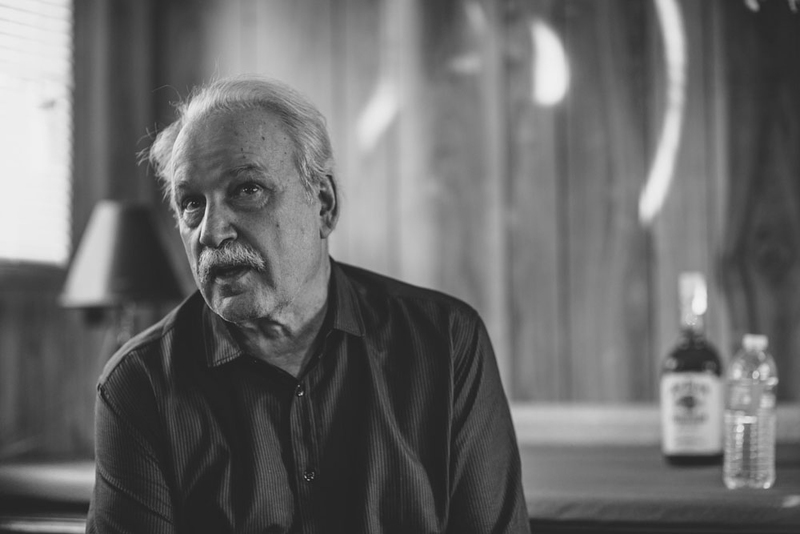 Rising to prominence in the disco era through his collaborations with Donna Summer (“Love to Love You Baby” and “I Feel Love”), Moroder soon found himself entrenched in scoring films, each one seemingly more classic than the next. From Midnight Express, Scarface, and American Gigolo, to more light-hearted fare like Flashdance and The Never Ending Story, he is as part of American culture as anyone without the Italian accent. Now living in L.A., Giorgio Moroder has “been pulled from the golf course” to perform high-profile DJ gigs. While cynical types might scoff at his DJ abilities, his literal use of the “play” button can easily be excused by his ability to stick entirely to his own catalog of classics, including work alongside the likes of David Bowie, Sparks, Bonnie Tyler, Irene Cara, Madleen Kane, Melissa Manchester, Blondie, Japan, France Joli, and of course, Summer. And his on-stage charisma only lends to embolden his iconic stature. It was prior to one of these engagements in Chicago I was able to sit down with the charming, 74-years-young Moroder. I was given ten minutes. This is how I spent our limited time. So do you enjoy all of these festivities? The festivities, yes. Interviews less. Especially before [going on stage], but it’s OK. This is kind of my origin story question, you’ve had a long career, but what was the first instrument you picked up? About fifteen. And the little story is that two of my brothers and a friend used to play guitar quite good, but like simple stuff. So then we made a bet that I go… I went to a school outside my little town, and I came back from Christmas after three months at school, and on the way there I bought a little booklet so that I could learn [guitar]. And I see that you could play up here [normal guitar strum] but you could play up here too [higher up on the frets], right? So I learned for like three months, came back, and they were all like [guitar noise], and I said, “let me show you [guitar noise] but I can do it up here, too.” One guy continued to play a little bit in his life, but my brothers never again. Because they had those three chords and I had all this complicated kind of [playing]. Was there a moment that you remember realizing that you were gonna just be a musician? Like did you know that at a certain point like this is what I’m gonna do? Yeah, I was playing during summer in little resorts and a guy just asked me, “Do you want to become a professional musician?” I said, “Yeah, yeah.” So I was still in school, and it kind of… I skipped one exam which I should have taken, didn’t wake up in the morning, blamed it on the lady next to me who didn’t wake me up, and became a musician, a professional musician, although then my guitar playing was so bad that they said, “No, no, let’s move [you] to the bass,” which, you know, bass is bass and you can fake a lot. So I learned to play bass while I was playing with the group, and I did that for about seven, eight years. When you switched from rock to more electronic music, was that born out of necessity, like did you feel you had to make a switch because of what was going on at the time? No, I just liked it. I just liked… I used to hear Walter Carlos with the Switched-On Bach with the synthesizer, and I said, “wow this is an instrument I have to at least, if not buy one, at least hear it, so I went to… I had a friend with the number one or maybe second Moog out, he played me some stuff, and I loved it. He had a great guy who knew how to use it, because, you know, with all the cables you had to be a scientist just to play it, so he was great. In the ’80s when all of the electronic music was kind of evolving, coming off disco, and since we’re in Chicago, Italo and Chicago house seem like they were kind of feeding off one another. Did you guys notice any kind of sharing or any back and forth going on back then? You know what, in the early ’80s or late ’70s I started getting into the movies, so I was on… my mind was with the movies, so I didn’t really follow. Plus, disco was supposed to be dead, so I said, ‘OK, if it’s dead then who cares?’ because I was in the movie business. But, in fact, it was not dead, because in Italy and Europe it was still on, but then I didn’t really follow the house stuff which originated here because then I did less and less music, played nice golf, until someone came a year and a half ago and got me back. Were you actually a sci-fi fan when you were making the songs for those movies, or was it just because your music fit so well? First of all, I love sci-fi. I remember when I was 15, 18, 19, 20 I would read one sci-fi booklet a week. Not the big ones, but I always liked it. So that was one of the reason I did it. I love… I thought, to create something which could possibly be the music of the future, I have to do it. I said to myself, ‘It has to be everything in the computer or the big Moog.’ So I started with the bass line, then I go with, you know, the white noise, the trigger, then you make a hi-hat, you make a snare, you make a bass drum, although the bass drum was really difficult because it doesn’t have that punch, that nice bass but not the punch. That was not the start of the synthesizer because I used it… I did my first hit actually in ’71 with a song called “Son of My Father”, which has the first synthesizer solo ever in pop. There was Emerson, Lake, and Palmer who had one song called ooh “Lucky Man”, but I was the first one to ever have synthesizer in a pop song. OK, last question: What’s the best grooming tip for a timeless mustache? You know, it’s my wife who got me back into the mustache. I had the long one, then the smaller one, and then one day I was in New York and my other, my ex-girlfriend, she said, “Why don’t you cut it?” Yeah, good idea. And I didn’t have the mustache for like, what, twenty years until she [his wife] thought I look better with the mustache. Yeah, the girls usually like the facial hair.